Within the organic oilseed supply chain, oilseeds and oils present a challenge and opportunity for those seeking to grow sales of organic food products, reduce waste, and increase efficiencies. This study was undertaken to better understand and bring transparency to these markets, specifically, the organic soybean, rapeseed, and sunflower oil and oilseeds markets. For the purposes of this study, Mercaris has focused on certified organic soybean, rapeseed, and sunflower oils, with conventional (i.e., non-organic and genetically modified organism [GMO]) oil markets providing a basis for comparison or context. 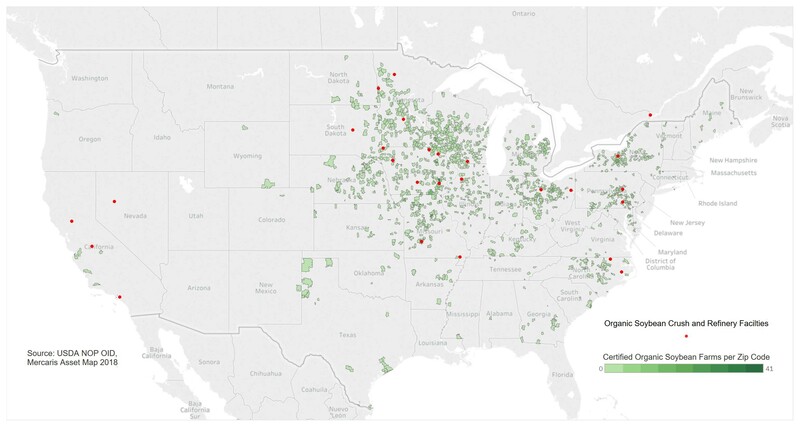 Organic soybean refining and crush facilities are heavy concentrated in the midwestern states where the greatest number of organic soybean farms are present.